I just returned from a lovely holiday in France. Every cell of my body is now officially made of baguette. There seems to be many stereotypes attached to the French people, but so many of them are true. They can be seen carrying bread around, they drink wine at lunch and they are fiercely passionate about their food. Although breakfast consisted of little else than bread and some fruit, there were nice cafe lunches followed by fancy dinner feasts that would satisfy our tummies for the rest of the night. Not a sustainable way to live for this girl, but I was happy all the same. Thankfully we would take daily trips to the market to buy fresh produce to replenish our vitamin stores. The markets were busting at the seams with the freshest, most beautiful produce. Upon returning home to Ireland, I felt inspired to make use of the aubergines I had seen in our local markets. Of all the unappealing things to call such a delightful vegetable, eggplant has to be the worst. I think we could all stand to get a tad pretentious and call them aubergines from now on. Same vegetable, now far more appealing. 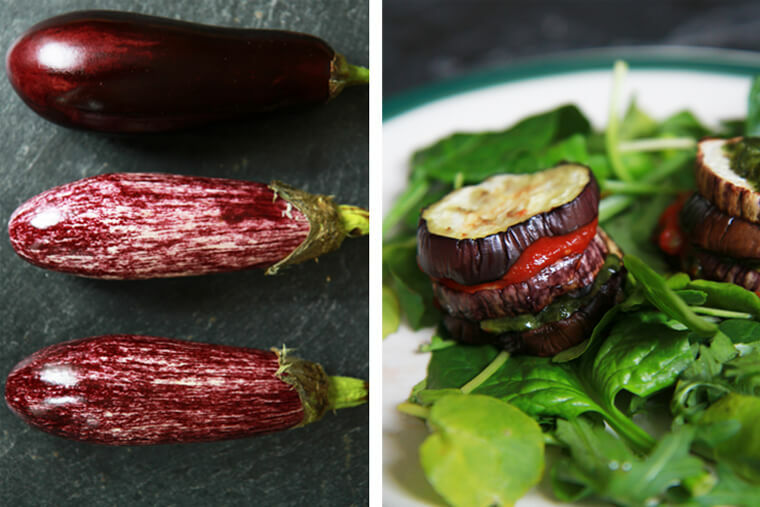 Aubergine is low in calories (only 35 calories per cup), but high in fiber – making it a delight for anyone watching their weight. 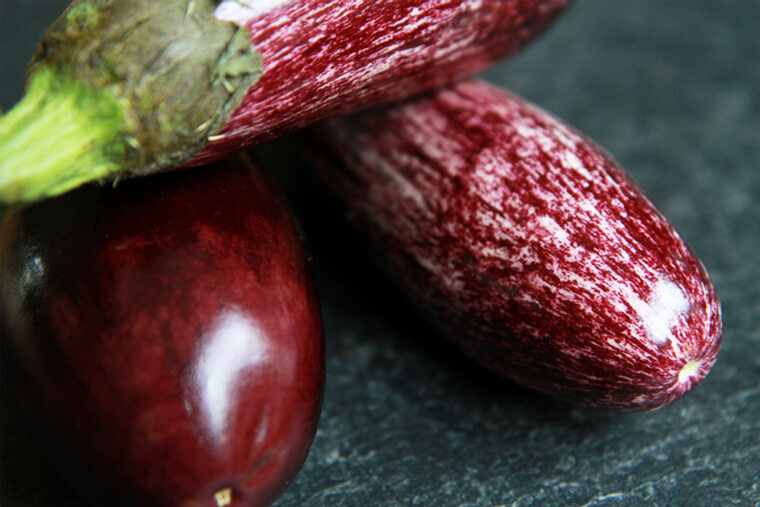 As mentioned above, aubergine is an excellent source of digestion-supportive dietary fiber. This fiber can bind to cholesterol in the digestive tract so that fat is not absorbed into the bloodstream. Aubergine contains bone-building manganese and vitamin K. They also are high in a chlorogenic acid, a powerful antioxidant offering antimicrobial and antiviral activities along with the ability to help lower bad cholesterol levels. If you’re feeling truly minimalist, just roast the aubergine with some olive oil and serve alone with the pesto. Or just pop it the oven and come back later to silky soft goodness. The aubergine and tomato would also make an excellent sauce for pasta. Just roughly chop the cooked vegetables and stir through hot pasta. 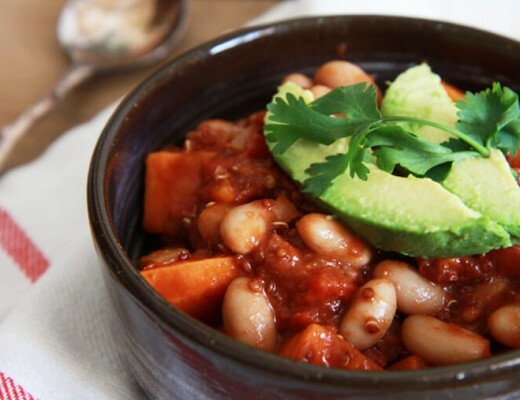 This dish is great to make ahead and reheat when you’re ready to eat – also a fantastic option for vegetarian entertaining. I have plenty more to say about my unbelievable trip, but for now I’ll leave you with a delicious recipe and the promise of more gorgeous, Parisian-inspired recipes to come! 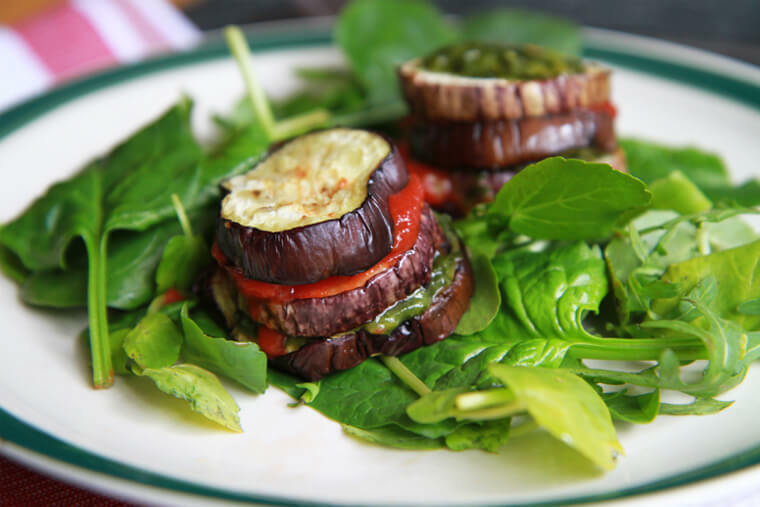 Slice aubergine into 1/2 inch slices and spread slices onto a baking sheet lined with parchment paper. Mix the oil and garlic and brush it on both sides of the aubergine slices. Bake for 10 minutes, flip slices and bake for another 10 minutes. Create your stacks by starting with one piece of aubergine, top with tomato sauce, and then another piece of aubergine. Top with pesto and fresh basil. Drizzle plate with more oil to get extra fancy. Enjoy!